Korean to English Translation - We are a Korean-English translation provider, specializing in legal, medical and engineering documents. We are a Korean-English translation provider, specializing in legal, medical and engineering documents. If your organization has a project requiring Korean language expertise, we can work with you to provide the right solution. To discuss your needs with us, please contact us by e-mail or by using the Quote Request form. 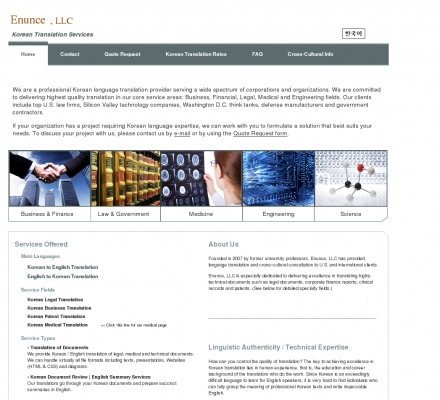 Description: Korean / English translation provider located in the Washington DC area, specializing in legal, medical and engineering documents.